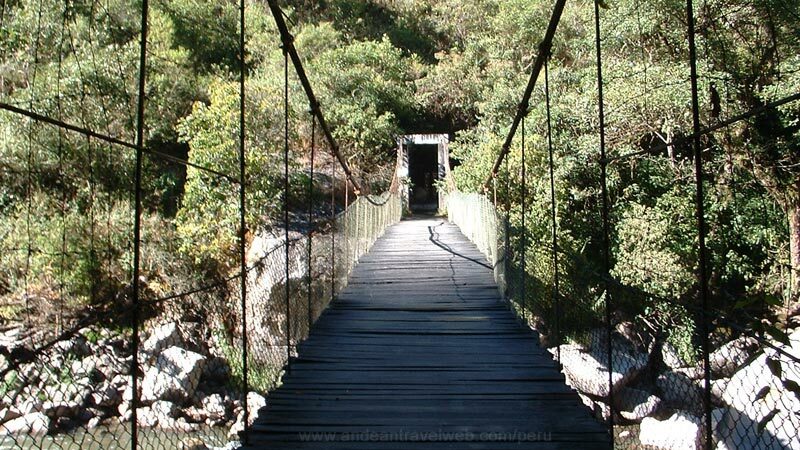 This trek is often known as "the two day Inca Trail", "the Sacred Inca Trail" or the "Camino Real de los Incas". The trek starts at Km104 (104 kilometres along the railway from Cusco) and involves a four hour walk uphill to Wiñay Wayna and a couple of hours further to Machu Picchu making it ideal for trekkers wanting to experience at least a part of the Inca Trail but haven't got the time (or energy) to complete the full 4 day trek. In the past trekkers have always been able to spend the first night of the trek at the basic hostal located at Wiñay Wayna. However due to many complaints about the standard and cleanliness of this hostal the hostal was closed at the end of 2004. This means that trekkers must now continue their trek all the way to Machu Picchu and spend the night in a hotel in Aguas Calientes. Groups then return to Machu Picchu for a guided tour on the second day. Apart from the waterfalls just before Wiñay Wayna there are no other places to refill your water bottle up (purify before drinking). Therefore it is recommended that you start the trek with at least 1.5 litres of water. This route is open in February when the Classic 4 day Inca Trail is closed. Many tour operators in Cusco offer this service throughout the year. For a basic pooled service (maximum 16 persons) expect to pay between $200 and US$250 per person. A typical tour usually includes: Hotel collection and transfer to station, return transport on train, boxed lunch on day 1, professional guide (English speaking), accommodation in basic hostal in Aguas Calientes including breakfast, entrance fees of 142 Peruvian Soles (about US$51 for adults). Students and children under 15 years old pay 122 Peruvian Soles (about US$44). Services that are generally not included: Breakfast and evening meal on the first day and midday meal on the second day, Bus between Machu Picchu and Aguas Calientes (Three bus rides required at $6 each way), Entrance to thermal springs, tips. The train usually departs Cusco at 06:15 for the three and a half hour scenic train journey to the start of the trek at kilometer 104 (104 kilometers along the railway from Cusco to Aguas Calientes). The trail heads down to the river where you'll find a checkpoint; a gate that guards the bridge over the River Vilcanota. On the other side of the river the trail heads off to the right towards the ruins of Chachabamba. 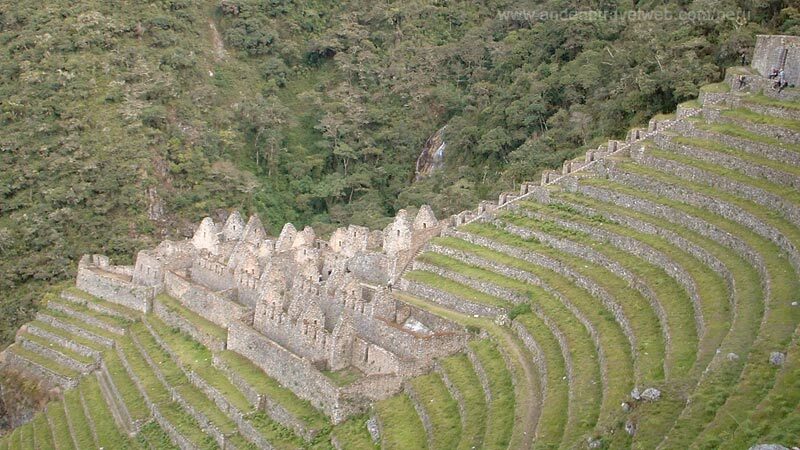 These ruins, discovered in 1940, are located on the old Inca road that ran along the southern bank of the Urubamba river. The style of buildings and stonework suggest that this was an important religious site, as well as having the secondary function as a gate house guarding this entrance to Machu Picchu. From Chachabamba the Inca Trail goes south and climbs the hillside, entering some woods and crossing a small stream. The path then turns west and continues uphill leaving the woods for open grassland. About 2 hrs 30 minutes after leaving Chachabamba, the path descends into a forest and much needed shade. A few minutes later you'll reach a beautiful waterfall. Soon after leaving the forest you will arrive at the foot of the superb ruins of Wiñay Wayna. It's a 15-20 minute walk to get to the Trekker's Hostal / Restaurant, climbing up the stairway to the urban area of the terraces, following the stairs off to the right. 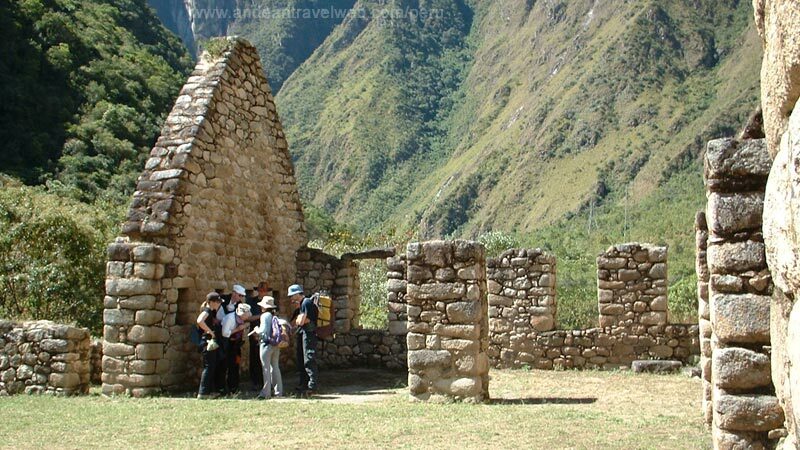 You'll then pass a series of Inca baths and follow the trail right to the Hostal. You can buy drinks at the restaurant and use the public toilets. 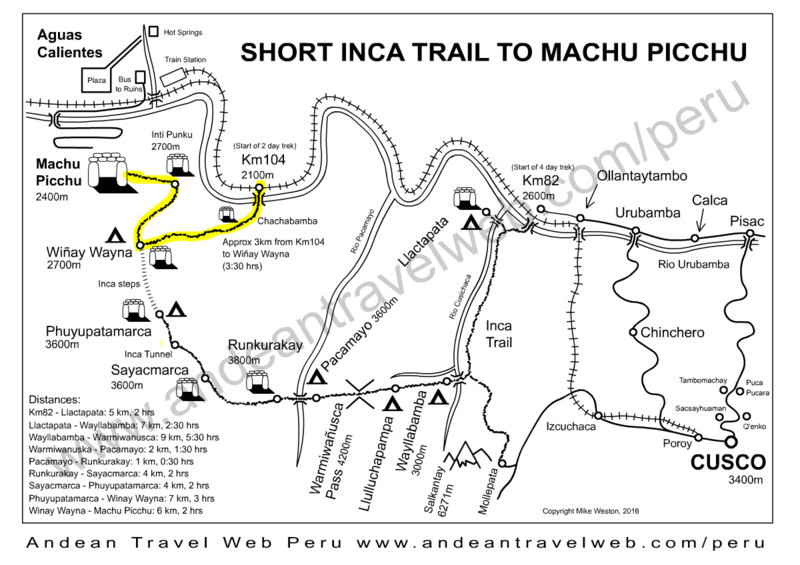 The trail from the hostal to Machu Picchu takes about 2 hours. The trail contours the mountainside and drops into cloud forest before coming to an almost vertical flight of 50 steps leading up to the final pass at Intipunku (Sun Gate). Suddenly the whole of Machu Picchu is spread out before you in all its glory - an unforgettable sight. The trail descends to Machu Picchu. Walking slowly and enjoying the beautiful scenery you should arrive at Machu Picchu by about 4:00pm. Usually you'll have a short time to take photos, but you will have to wait until the following day for a more extensive visit and guided tour. You'll return to Machu Picchu, taking the early morning bus up to the ruins which should arrive just before 7:00am, in time to enjoy the sun rising over the mountains. The guide will start a tour of the most important sectors of the ruins which takes about 2 hours. After the tour you will have free time to climb the mountain of Wiñay Wayna overlooking the ruins of Machu Picchu (allow about 2 hours to climb and descend). You can have lunch just outside the ruins or take a bus to the town of Aguas Calientes where there are plenty of restaurants to suit all budgets. The train departs Aguas Calientes late in the afternoon.